Housing Associations have a legal duty to carry out suitable and sufficient risk assessments for their building and maintenance activities. Appointed contractors must be competent and have their work routinely monitored. In-house maintenance teams must also be continually risk assessed. This requires a sustained, systematic and organised approach, revisiting risk assessments as well as checking and acting on new information. Although responsibility for Health and Safety cannot be outsourced or delegated, Housing Associations do not need to operate on their own. External support, delivered by expert advisers can help to overcome concerns as well impart best practice. The Building Safety Group (BSG) can help Housing Associations to mitigate against risk and ensure compliancy with UK Health & Safety law. Achieving and proving excellence in health and safety risk is a reflection of the Housing Association’s ethos and professionalism. It will also help to avoid costly accidents, disruption losses and damage to the organisation’s reputation, whilst ensuring compliance with UK legislation. BSG’s reporting suite will detail any risks associated with building or maintenance work and the precautions which must be taken to minimise risk. 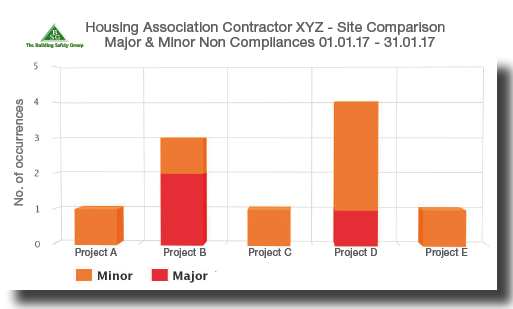 Housing Association’s can use BSG’s risk assessment and reporting suite to monitor and assess contractors working on site. In-house maintenance work can also be risk assessed on a regular basis.